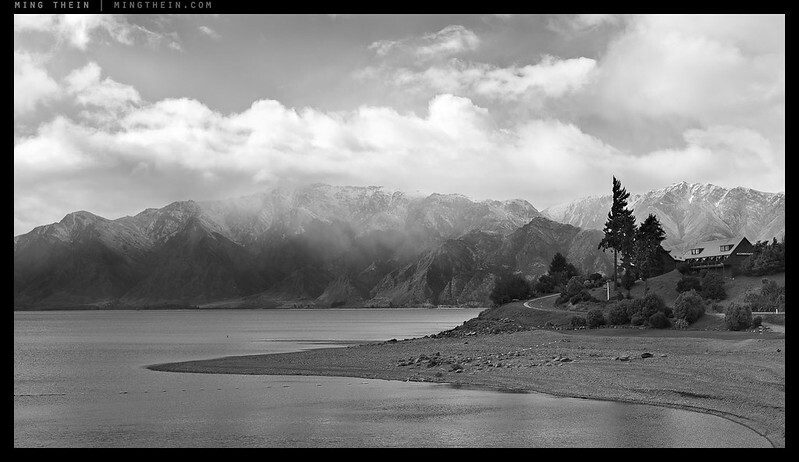 Lake Hawea I. Available as a 16×20″ (~40x50cm) Ultraprint on Canson Infinity Platin Fiber Rag baryta; $500, signed edition of 20. The price includes shipping by courier anywhere in the world. Please include your phone number for the courier in the comment field when ordering. I drove north from Queenstown, struggling over a blizzarded mountain pass with my woefully underpowered rental car, pausing every few kilometres to install or remove snow chains, freezing fingers and getting my daily intake of iron via the absorbed rust. The pass was beautiful but there was no safe place to stop, so I did not shoot. I kept driving in search of the inevitable end of storm landscape that would come; these things blow themselves out fairly quickly in New Zealand because of the winds driving them off the Antarctic continent. 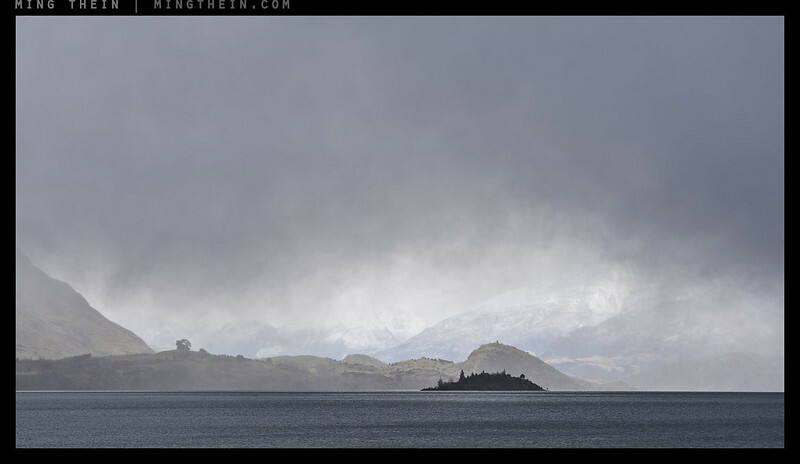 Sure enough, after Wanaka and another twenty or so kilometres, I rounded a small cape and came to the other side of a low range to find Lake Hawea spread out before me – with clouds just receding over the mountains and an impossibly intense metallic cyan hue to the water. I stopped, looked, and got two shots just before the clouds blew off a little more and the sun broke through completely. The image is monochrome because it better preserves the mood – you feel the serenity of the lake, the isolation of the cabin, and the openness of space without the blues dominating. I’ll be launching the gallery with five prints: thereafter, they’ll be singles or pairs. Please note that all prices are inclusive of courier shipping via DHL Express anywhere in the world; you’ll need to include your phone number in the comment box when you check out as it’s required by the carrier. This is the showpiece for the launch, which will be offered as the largest Ultraprint yet: 40×15″ image area. We’re still experimenting with the paper type to manage reflections and improve the viewing experience – but so far, it’s like having your own personal slice of forest at home. 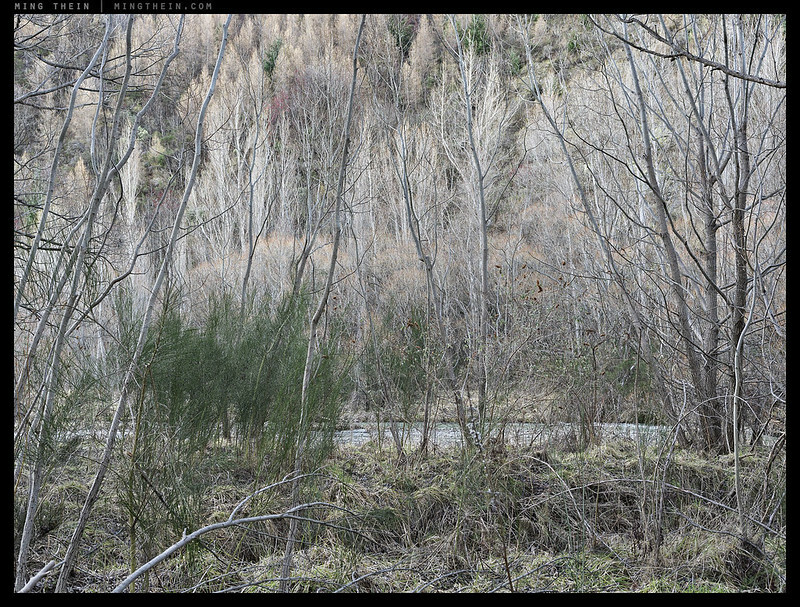 Forest III, Shotover Gorge, Queenstown, New Zealand. Nikon D810 and an 8-image stitch. Click here for a 100% crop to get an idea of just how much detail is in this print. We spend so much time looking for shadows and light that sometimes I think it’s interesting to present a three dimensional world as a two dimensional one for that precise reason; there are enough visual cues for texture, but not so many as to destroy that illusion. It’s one of my favourite images from this trip because of the balanced minimalism and abstraction that appears almost manmade, despite being 100% natural. 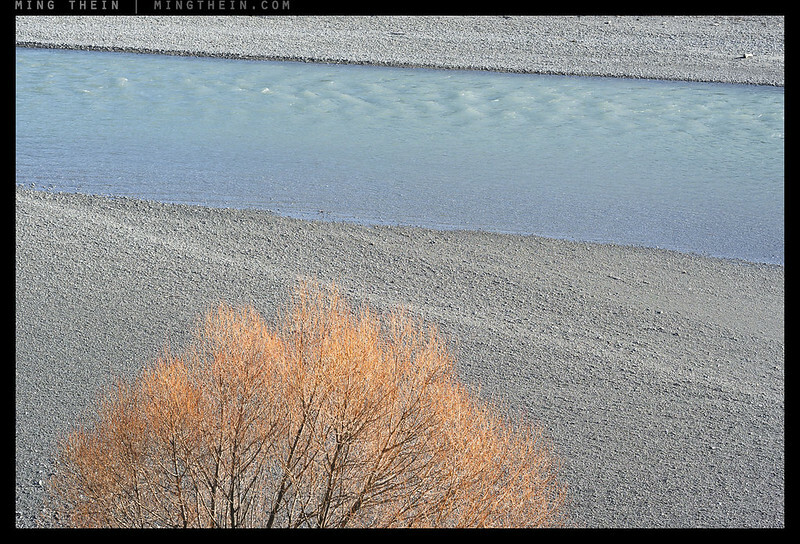 Note: the river was actually that color due to it being glacial meltwater containing various alluvial deposits. On the actual image you can see the near shore is actually extremely clear. 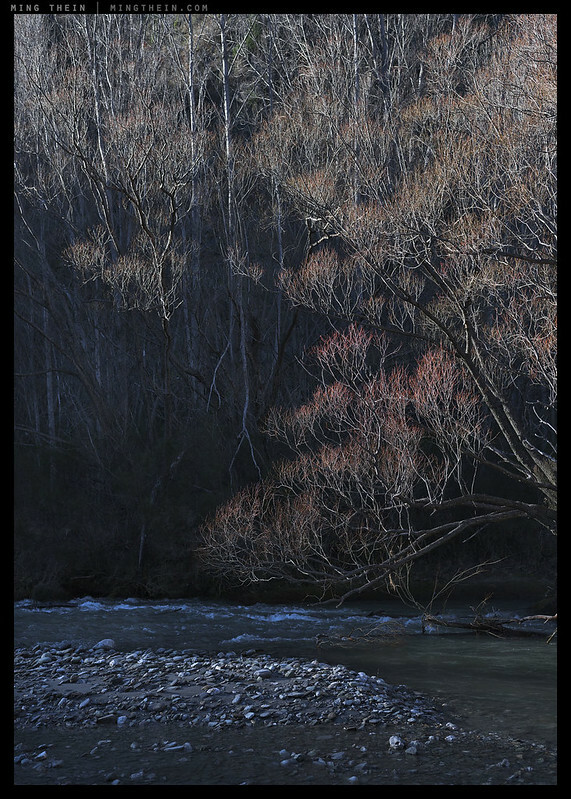 This is the first of three images that were shot in the same river delta just outside Arrowtown, New Zealand. I spent the whole afternoon here watching the light change and the various portions of the mountainside and alpine forest change as they moved in and out of the light; colors got richer as the sun went down, then ended in an interestingly muted twilight that made everything just feel…soft, for want of a better word. I believe this image, of the dozens I captured, is the most accurate representation of that. There were some small cascades in the river – but they weren’t as interesting (personally) as the cascades formed by the winter leaves/buds/tips (I admit, I’m no botanist) of the trees. The reddish ends formed a very delicate waterfall of color, which here, leads down to a stony bank by the water. 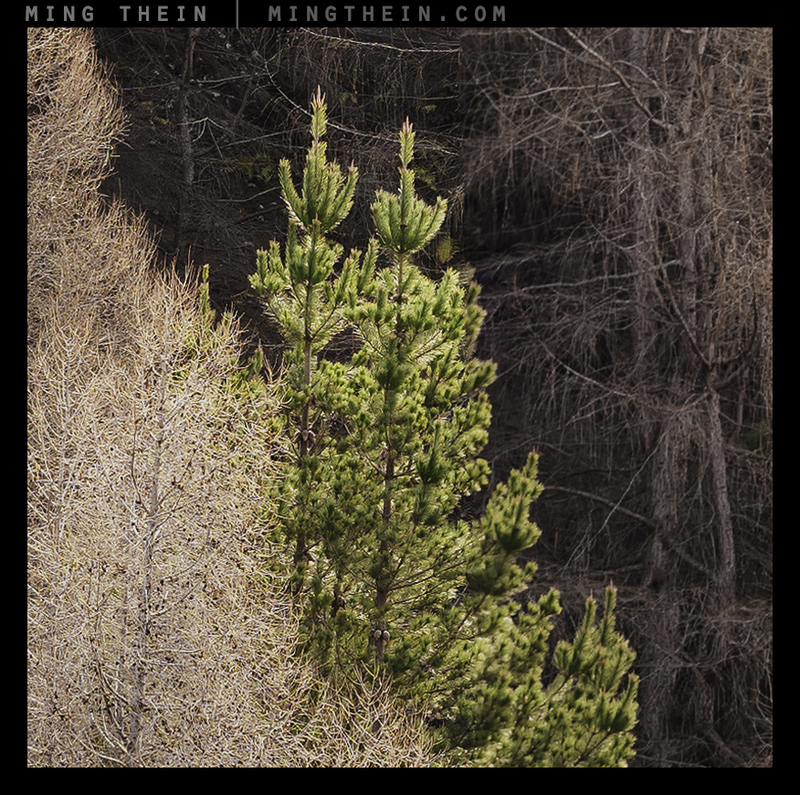 I waited some time to make this image: it would only work when the light just hit the tree and not the side of the mountain behind; for a couple of minutes I got what I needed. 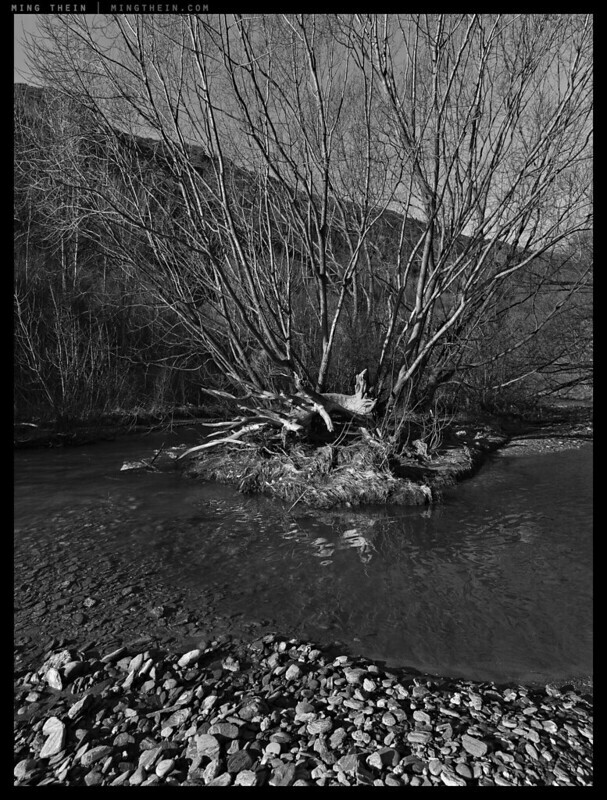 The final image is one for the monochrome aficionados – the curve of mountain, flowing river and tree to the nexus of the dead and sun-bleached log at the centre I’m sure contains a metaphor for life somewhere – personally, I just find the tonality and structure very appealing. Testimonials from previous Ultraprint customers can be found here.